The classified details behind Iran’s treatment of several U.S. sailors who were captured by the Islamic Republic during a tense standoff earlier this year are likely to shock the nation, according to one member of the House Armed Services Committee, who disclosed to the Washington Free Beacon that these details are currently being withheld by the Obama administration. Rep. Randy Forbes (R., Va.) told the Free Beacon in an interview that the Obama administration is still keeping details of the maritime incident under wraps. 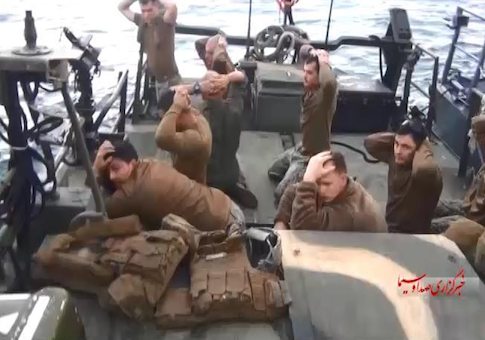 It could be a year or longer before the American public receives a full accounting of the incident, in which several U.S. sailors were abducted at gunpoint by the Iranian military. "I’ve had a full classified briefing" from military officials, Forbes told the Free Beacon. "It could be as long as a year before we actually get that released." "I think that when the details actually come out, most Americans are going to be kind of taken aback by the entire incident, both how Iran handled it and how we handled it," Forbes disclosed. "I think that’s going to be huge cause for concern for most Americans. That’s why I’ve encouraged members of Congress to get that briefing so they do know exactly what did take place." "I think clearly there were violations of international and maritime law that took place here," Forbes said. "We [the United States] did almost nothing in response, in fact, to have Secretary [of State John] Kerry actually thank them for releasing our sailors after they way they captured them, I think was a slap in the sailors’ face." Forbes is pushing a new measure that would increase sanctions on Tehran for its treatment of the U.S. sailors in order to hold Iran accountable for its aggressive behavior. Forbes’ measure outlines a range of Iranian aggressions against U.S. forces in the Persian Gulf region. "Iranian military and paramilitary vessels have repeatedly behaved in a dangerous and unprofessional manner in close proximity to naval vessels and commercial shipping operating in internationally recognized maritime traffic lanes," according to a copy of the measure viewed by the Free Beacon. The list of provocations includes a December 2015 incident in which Iran conducted a "live firing exercise within 1,500 yards of the U.S. aircraft carrier Harry S. Truman." Iranian military aircraft buzzed the Truman and a French aircraft carrier in the region in January. "The administration will not stand up and say this is just wrong," Forbes said. "Instead of thanking them the administration should be standing up and saying its wrong." Congress must take action to hold Iran accountable for its aggressive military behavior, Forbes said. "These kind of actions undermine stability in the Gulf," he said. "And they raise the danger of inadvertent escalation." "I think it goes without saying that if that’s the case and they won’t stop that activity, all of that should at least be considered and debated as part of any Iran sanctions bill that may come up in the future." This entry was posted in National Security and tagged Iran, Randy Forbes. Bookmark the permalink.